Apple Sells 2 Million iPads in 60 Days! So much for people not buying Apple iPad for its lack of support for Flash. Apple launched the iPad with a bang and has continued to sell them like hotcakes. 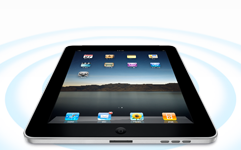 The company has already passed the 2M mark in the number of iPad units sold. It took Apple 74 days to reach that number with the original iPhone. iPad is ahead of those numbers by some distance. Considering that Apple is expected to bring iPad to a few more international markets soon, there is no reason it can’t keep its momentum going for a while. said Steve Jobs. That’s fine and dandy Steve. It would have been much better if Apple had listened to loyal fans and had included a webcam and a few other features in the first generation iPad. We suppose the company had to keep some of those features for iPad 2. 2010 is going to be a huge year for Apple. With iPad and iPhone 4G hitting the market this year, Apple has a lot going for it. What it can’t afford is losing market-share to Android. That’s why it is expected to pursue an aggressive strategy with iPhone 4G. Apple may not be on good terms with Adobe and is going to be challenged by numerous companies in the upcoming months. Nevertheless, it’s tough to see any company coming up with an iPad killer anytime soon. Apple Declining, 10 Years Behind Microsoft in Security? Mac App Store, iPad 2 Launch Dates Revealed? Should Apple Release a 7.85 Inch iPad?